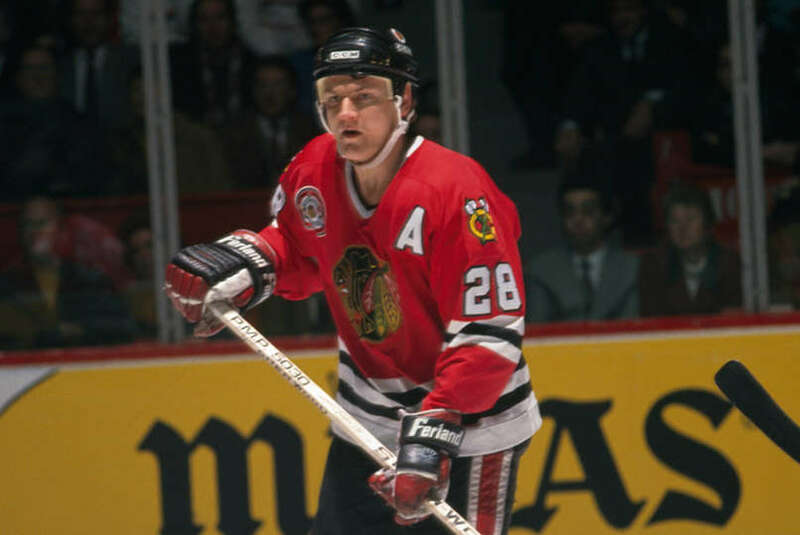 The Blackhawks produced a “Throwback Thursday” video celebrating the legacy of one of the best players to ever wear the Indian head, Steve Larmer. Another reminder that Larmer’s number should be retired by the Blackhawks. He still – even through the exciting early 90s and the current dynasty – ranks among the franchise’s all-time best. One of the all time best and my favorite player growing up. Glad Keenan pulled him to NY for a cup he deserved. Retire his number put him in the HOF already! Still remember Gramps return game wearing Ranger Blue and his scoring a penalty shot against the Eagle. Crowd went wild! Never should have been traded! Hummm…. I made a lot of money with Larmer…i had a few friend at the time who beleive he was just a ordinary player …heheheh …and didnt miss many games for the Hawks …never hurt ..never sick …what a player he became …. The only problem I have with retiring his number is the legacy still to come with this dynasty. Toews, Keith, Kane, Hossa, Sharp, and Seabrook/Chelios all deserve to have their numbers retired. One could reasonably argue for Crawford as well, if he plays well for us throughout the remainder of his contract. Then you have to make room for future players as well. That’s a lot of retired numbers. You retire Larmer, how about Roenick? Just not sure that Larmer is on the same plane as Toews & Co…. Maybe this is a precursor to the Hawks putting his jersey in the rafters…Or the beginning of their public plea to help him into the HHOF. At which point theyd put his number up. Steve Larmer was the ultimate team player and fan favorite. He wasn’t flashy like Kane but put up big numbers anyway. Give us a Larmer on todays team and we are favorites to win the Cup. I have nothing but respect for #28, what a player he was. There Is No Doubts He Was One Of The Best….One Of The Greatest Lines Ever….Savard,Secord,Larmer…His Number Deserves To Be Up There With J.R. The Habs have also won 24 Stanley Cups, absolutely no comparison between the two franchises. The so-called Magnificent Seven–the core players that together won the three Cups–are each more deserving than Larmer. Crow arguably is also more deserving; he owns the franchise record for playoff wins. He is the only Hawk goalie in history with two rings. And hopefully 30 years from now the Hawks will have another player or two who are worthy. Larmer was a very good player but he wasn’t great, which should be the standard for retirement barring participation in a dynasty, such as the Mag Seven plus Crow. Roenick actually had much better career numbers and in many ways was the better Hawk player. Larmer won his ring with NYR. I’m happy for him. But the Hawks shouldn’t go crazy with retiring sweaters when there are many players worthy of the distinction coming up in just ten years. With just six or hopefully seven-ish Cups down the road, we shouldn’t have the most retired sweaters in the NHL. Hjalmersson and Crow deserve it as much as the other six, and Chelios could also be honored in a joint ceremony with Seabrook like Maggie, who honestly didn’t achieve greatness. If anyone shares this belief, I beg that you do yourself and the rest of the hockey world a favor and educate yourself. The “players worthy of the distinction coming up in just ten years” are still chasing Larmer’s numbers. And will be, in many areas, for a big part of those ten years. And I love Roenick as much as anyone – he wrote the forward to my book – but to say he had a better career in Chicago than Larmer is hilarious – and wrong. Sorry. Reminder: hockey was played in Chicago before 2008. Chasing Larmer’s numbers? Educate yourself. Gretzky was scoring more than 200 points a year when Larmer was scoring 441 goals in a career, roughly 75 less than Roenick. I watched Hull, Espo, and Mikita play live at the Stadium. Jamie Benn led the NHL in 2015 with 87 points. Get a clue, the game had fundamentally changed. Larmer’s numbers aren’t chaseable in today’s game. There is no comparison between eras. The current dynasty players, six minus Sharpie, deserve immortality over a player who put up merely good numbers relative to his era over someone like Kane who blew away his competitors, albeit with far fewer points tha Larmer. How many Cups did Larmer win? Discover the concept of statistical standard deviation. Larmer was merely “good,” nowhere team immortality. Educate yourself. . .
Get a clue. Larmer’s best run was 41 and 43 goals in 1988 and 1989. Roenick scored 41, 50, 53, and 46 from 91-94, which encompassed Larmer’s tenure on the team. Larmer never approached 50 goals. Roenick’s 513 goals blow away Larmer’s 441 as does his 1216 points to Larmer’s 1013. Roenick was tough as nails, Larmer not so much. And to note a minor misspelling of Hammer’s name on an iPad, an “e” for an “a” just two keys away is a joke. Get a real argument. Crow holds numerous Blackhawk records. Larmer was a very good player who won nothing for the Hawks save a Calder, big deal. Lets retire Panarin’s number. Hawk history started before 2008? I cried when the Hawks blew a 2-0 lead after two periods to Montreal in 1971. I was there at the Stadium before you were even born, Bamford. Roenick’s stats blow away Larmer’s. Bam, feel free to base your reply on an iPad typo. What a joke…. How is someone who graduated from high school the year Larmer won the Cup with the Rangers an expert on Larmer’s tenure with the Hawks? Watch a lot of home games on TV back then, Bam? Agree 100 pct with Scott on this one. Its your blog Tab so you make the rules fine. But a valid argument is a valid argument, hjalm typo or not. I love your coverage of Hawks Tab and appreciate the efforts used in running and admin-ing a blog (I have 2 of my own). Your analysis is pretty solid regularly and extremely insightful but you also have a pretty damn knowledgeable group of hawks fans following and contributing to your articles. I feel your blog would benefit from less derision and sarcasm both from yourself and others. Just my two cents. Again, its your blog to make as friendly or hostile as you like. Roenick was my first ever favorite nhl player. He and chelly and larmer and belfour were the reasons I started cheering for (and still die hard for) the hawks. Larmer had lots of intangibles, reminded me a lot of messier just not as mean but roenick was the heart and soul, human highlight reel and wreckjng ball of the hawks back then. Neither achieved remotely the success of current hawks (legends) toews, kane, keith,seabs, hoss, hjalm, and yes you can put crow in there now with Sharp too. Based on careers roenick and larmer had great ones but didnt get the cups the other guys did. If you base retiring jerseys on team success, neither gets it. Individually they are deserving of having their numbers hanging in the rafters. With that said, the current hawks peviously mentioned (and Sharp) are deserving of yet another level of immortality. Scott, Larmer was a whole lot more than scoring goals. Top penalty killer, powerplay, ironman that came to play every game that never missed a shift. Players today the way the NHL is set up just don’t match up, Larmer would command top money with any team. Darren – spot on for the most part but, if championships is the barometer for greatness, Esposito and Maggie never would have had theirs retired. There is such a thing as being a really good role player; Hjalmarsson has been an outstanding player. but he isnt elite. Keith is the only Hall of Fame defenseman on this team. To Scott’s nonsense and to others commenting on Roenick, a big piece of my criteria for retiring a player’s number is how much of his career was played here. Roenick, like Chelios, played more games somewhere else. His gross career totals are gaudy, but look at what he did during his brief time in Chicago. big individual seasons but no individual awards and no titles. Roenick was one of the best players of his generation – but he did it in how many different jerseys? Tab, Roenick was one of the best players of his generation yes and his best years by far were played in chicago. He bled blackhawks. He didnt cry because he never won a cup. He cried because he never brought a cup to chicago. Big difference. He put blackhawks on his back many times despite not being able to lead them all the way to the promised land. If the criteria is not championships nor having to live up to the near impossible standards set by toews and co, then roenick (and likely larmer too) get their numbers retired. Punishing roenick for being traded and simply trying to continue to excel despite numerous injuries seems cruel and unusual punishment. Regarding Hjalm, I defy anyone here to name 5 guys (defensemen) in the entire league you’d rather have out in the last minute of a game protecting a one goal lead. He is as elite as they come in the form of a true defense-first defenseman. One that doesnt get blown by on the outside, doesnt cough up the puck in their own zone, doesnt forget to tie up sticks in front of their net, doesnt let the pass go thru on two on ones, always has his stick in perfect position to cut down opposition options, knows when to dive or slide and when to be physical or to poke check or lift a stick. He makes hard safe passes out of the zone and can hit a streaking forward on the tape across two bluelines. His shot is less than elite but still gets on target more than not and finds a way to contribute offensively when needed the most. This guy is the ultimate warrior. Ive seen him block 2 shots on a shift, not able to put his foot down, stay out there, tie up a stick to save a goal and then get in front of and block a 3rd shot all on the same shift. Calling him not-elite is saying that you cant be elite unless you score a lot of points as a player and doing a huge disservice to true defensemen. Erik wheres my own zone Karlsson is the farthest thing from a defenseman and it makes me sick to see him get votes for the norris over warriors that do everything right like hjalm who gets way overshadowed by keith and seabs but takes a back seat to noone in my mind. So yes hjalm is elite and a fantastic role model all defensemen shoul d strive to be like. Hjalm deserves his #4 retired too. re: Darren – Lots of people got emotional over the Blackhawks winning the Stanley Cup in 2010. Tony Amonte – who scored more goals in the Indian head than Roenick – probably cried. Chris Chelios – who won more individual league-wide awards while wearing the Indian head – drove back for the parade. The fact is, JR played 524 of his 1,363 career regular season NHL games in Chicago. He scored 267 of his 513 career goals here. Is he a Hall of Famer? I would argue yes – with more than half of his career coming somewhere else. If we’re talking about retiring a number, it has to be about contributions IN THAT SWEATER. Larmer still ranks 3rd in franchise history in goals scored, fourth in points and seventh in games played. I appreciate that Roenick was a sensational player, but his total production WHILE A MEMBER OF THE BLACKHAWKS doesn’t add up to Larmer’s. That’s a fact. re: Hjalmarsson – love the guy. really, I do. But if we’re REALLY going to talk about lining up numbers to be retired, there’s a LOOOONG line of guys WAAAAAY ahead of Hjalmarsson, starting w/ Doug Wilson. Sorry, but being a really good shut down defenseman doesn’t get your jersey retired. It earns you the respect of people who pay attention, but not a sweater in the rafters. Roenick played 524 games in Chicago and 839 games somewhere else. Patrick Kane has played 134 more games in the warrior head than JR. Larmer played 891 in Chicago. He’s 81st all time in points. Larmer had 153 pp goals. Nikita is number 2 on the Hawks with 127. 5th in even strength goals. 3rd in even strength goals. 2nd in goals on ice for. Tied for first in hat tricks. There is a stat that adjusts for era. Larmer would be 4th in adjusted points behind Mikita,Hull,Savard,and Kane. In order the totals are 1478,1225,899,768,765. 40 year Hawks fan here- season ticket holder in Larmer’s era and beyond. Never miss a Hawks game. And here’s the truth Scott: Larmer should be a hall of famer- and unquestionably deserves his number retired. He’s 131. 1 point better than Dany Heatley. 2 points better than Ribeiro.